Archaeologists from the University of Michigan believe they have found what is perhaps the oldest Roman temple still in existence. Built around the 7th century BC—probably for the goddess Fortuna—the temple tells us a lot about how the Romans built their city, thousands of years ago. The team used heavy machinery to drill a rectangular hole 15 feet deep. A crane lowered large sheets of metal to keep back the soggy soil... The foundations of the temple of Fortuna were visible for only three days — for security reasons, the team could not leave the trench open and it had to be filled up again. 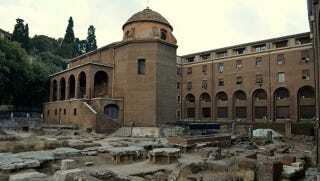 When it was built, the temple would have been located right on the edge of the the Tiber River. Today, the river runs about 100 yards from the site. But this means that Roma engineers, even in the 7th century BC, were doing things like manipulating rivers to flow in ways that benefitted them. In this case, they did so to build a harbor temple—which also served as a symbol of trust and a center of free trade.